STOP! If you have just arrived at this website looking for a floating raft system, you might want to go back to page one of this mini-farm plan. NOW, let's get these babies growin'! 10. 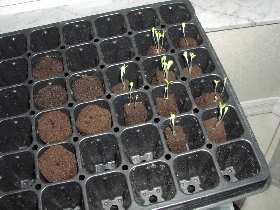 Time to transplant your baby seedlings into the raft. Place the starter plugs into the net pots and carefully pack around them with LECA (clay balls) to help support each plant in its pot. Push the little net pots into the pre-cut holes in the styrofoam raft. 11. Plug in the airstone bubbler and watch 'em grow! We had been harvesting the outer and lower leaves of these Romaine lettuces for salads. We went out of town for the weekend, turned the thermostat up and forgot to leave a fan on; the poor darlings bolted! (No, they didn't take off, just went past their prime 'cause it got too hot). Above you can see how the leaves are drooping out instead of nice and tight. We harvested the whole raft after we took this picture and had an enormous Caesar salad. Yum! This is a photo of a different type of lettuce from our large raft. Just wanted you to see what happens to the roots. They grow down into the solution reservoir. Sweet, neat and clean. 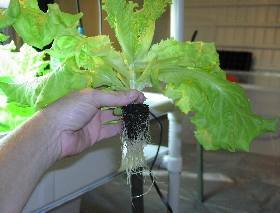 Don't forget that lettuce grown outside is a cool weather crop. Indoors in your hydroponics set up, try to keep the temperatures below 75°. 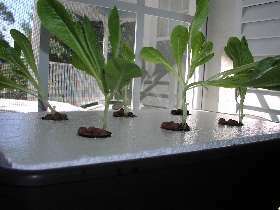 For a continual harvest and the most effective use of your lettuce raft, plan ahead so that each head of lettuce you harvest can be replaced with a new seedling ready to go. Fast-growing and do not form tight heads. These are the lettuces you see in the market of various different colors, bronzes and reds. They create a most attractive and tasty salad bowl. Check seed packets to find a variety of colors. Also is a quick grower and can tolerate warmer temperatures. Puts out delicious tender oak shaped dark green leaves. A small headed variety with a delicious sweet taste. One head of Bibb makes for a good salad. More heat and disease resistant than others. A classic favorite, produces heads with luscious, buttery texture. Also heat resistant. Caesar salad anyone? Romaine lettuce produces elongated thick crisp and savory leaves. Romaine is probably the most heat resistant lettuce you can grow.